At Home, Writing is pleased to welcome its wonderful readers to the first Guest Blog. I am excited at the opportunity to learn from the perspective of fellow bloggers. I hope you all would enjoy interacting with these discerning guests too. In the short span of six years between 1946 to 1952, Eva Perón, the wife of the Argentinean dictator and founder of the Perónist party, Juan Perón, won over the Argentinean people so much so that her popularity was said to rival, if not exceed, that of Juan Perón himself. Having risen from obscurity, the youngest daughter of an unwed mother, her rise had been all the more spectacular. 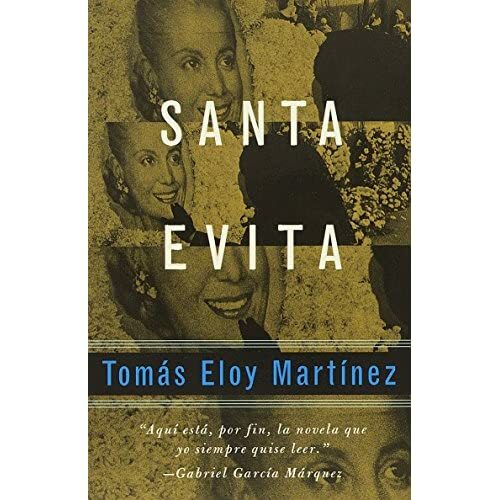 Tomás Eloy Martínez’s Santa Evita could have been termed as a biographical account Eva Perón’s life had the author chosen to write about her short but eventful life. Instead, he has chosen to write about her corpse. Eva Perón’s body, like Lenin’s, was embalmed after she died of cancer at the age of 33, at the height of her popularity. However, before the corpse could be housed in a mausoleum for public display, Juan Perón was overthrown in a military coup, and thus began the after- life journey of Eva Perón, as the incumbent military government wondered what to do with the embalmed body. To bury the corpse could have, they feared, incited the loyal Perónists and even the masses. And Eva dead was perceived as more dangerous than the living one. Even a few replicas were created to mislead any followers, and attempts were made to bury them. For over a decade, the corpse and the replicas changed hands and locations, traversing within Argentina and to Europe- one replica was buried in Bonn and the actual corpse in Milan, Italy from where it was finally recovered and returned to Juan Perón after his return from exile in Spain. Martínez recounts the stories of all those that came in contact with the corpse, and the often calamitous ends that they came to. Insidious accidents awaited those entrusted with the corpse. Some were haunted till death, some met with inexplicable accidents and others were relentlessly followed by a mysterious person called the ‘Commander of Vengeance’. It is characteristic of Martínez to write a novel that takes the after- life of Eva Perón rather than her not less eventful life as its theme. He does show us slices of her life too, but often as flashbacks and in recollections of those that he meets with. In a sense, therefore, he underlines the persona that outlived Eva Perón herself. This is akin to his previous novel, the redoubtable The Perón Novel, where he focused not so much on Peron’s politically active years, but the seemingly innocuous journey of an exiled dictator returning to his home country in old age. Santa Evita is a novel within a non- fictional account where Martínez goes out in search of information about Eva Perón’s corpse- the story emerges as he interviews people associated with Eva or later with her restless corpse. He makes the reader an accomplice in this journey of discovery- it becomes very much like a mystery in which the reader has as many, and more often as few, clues as the writer. This makes the novel extremely readable, if not racy. Santa Evita turned out to be unputdownable, and I finished it within a week. Along with The Perón novel, it has been one of my best reads from Latin America in the last one year. Note:Bhupinder Singh is the author of a reader’s words–a blog encompassing a wide spectrum of the literary world. From Dalit literature to Latin American authors, and from regional Indian writers to Leftist writings, Bhupinder covers it all. His blog is not limited to just books and authors, though. The subtitle–comprising keywords such as literature, left, liberal, socialism, globalization, dalit, books, Urdu poetry, south Asia, India—is indicative of the inclusive nature of his blog. Fascinating mythic element here , like unto King Tut’s Curse.Thank you. Excellent review of an intriguing book. Some people just refuse to die even after death, no? Here, not only is the premise interesting, but it appears the piecing together of the information is equally well done. Now, if I can find this book in stores here. Thanks for your comment, Bernita. The interesting thing is that this mythical element belongs to the 20th century and is so much intertwined with the history of modern Argentina.Bhaswati: Thanks for putting up my review and thanks for a wonderful introduction too :-)To get the book in Delhi: You may like to check with ‘Fact and Fiction ‘ bookstore in Vasant Kunj, they have a good collection as far as literature is concerned.Or Bahri’s in Khan Market may be able to procure on request. I have had this book sitting on my bookshelf for years – now I need to take it off the shelf, give it a good dusing and sit down somewhere peaceful and quiet where I can devour the contents. Thank you, Bhaswati; thank you, Bhupinder Singh! What a mysterious and strangely intriguing story here, Bhas. That afterlife bit, yet while not having left Planet Earth feels somewhat surreal and one wonders that an unknown soul wouldn’t have received more immediate peace.Bhupinder presented to me a well-rounded and educational review and how marvellous of you Bhas, to introduce an engaging guest blogger. Simran, Lotus Reads, Susan: Thanks. Glad you liked the post. It was such a pleasure to have Bhupinder as a guest. I only hope he will keep returning to educate us more.